The current economic crisis has many mixed impacts, including the shift of grocery customers to low-cost companies like Wal-mart. Yet at the same time we see a shift to local, community markets in an effort to cope with the new economy. While the global players deliver discounts due to their enormous volume, local community markets offer low-priced produce, goods, and services due to their microscopic volume. This common ground between individual efforts and enormous buying machines yields an interesting treasure trove of passion and hope. As folks cope with financial turmoil, their choices for purchasing venues seem to be driven by the need for saving, as well as the need for a good experience. The middlemen, such as the regional and national chains, seem to be squeezed in between truly global players like Wal-mart, and the rising tide of localism appearing at a grass-roots level in so many communities. The rise of these small, open-air markets is an encouraging sign of authentic social interaction, after so many assaults upon our social network by the forces of the Old Economy. It suggests a new role for local entrepreneurs and for the revival of community spirit. At these local markets, producer and consumer traffic in direct interaction, without the army of marketing consultants, business analysts, merchandisers, industrial psychologists, and the rest of the hangers-on who have transformed the agora into an often dispiriting and uninteresting shopping experience. Now, with the Old Economy in shambles, the New Economy appears to be reviving the community element to our American commercial culture. Even a few years ago the Farmer’s Market was considered an anachronism, something found in rural areas and overlooked by cosmopolitan city dwellers. The fact that these are rising up in our urban and suburban culture speaks to our need for freshness, for authenticity, and for some spontaneity. 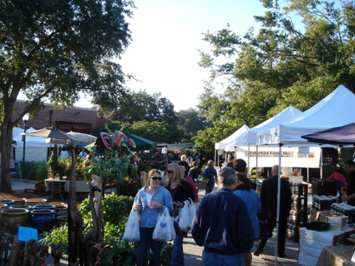 In Central Florida, the Winter Park Farmer's Market is perhaps the grandfather of the Central Florida market scene, having started sometime in the eighties. No one at the City could remember exactly when it started. Ron Moore, Parks and Recreation Assistant Director now manages the market, and he laughed when asked about its success in a recent interview. 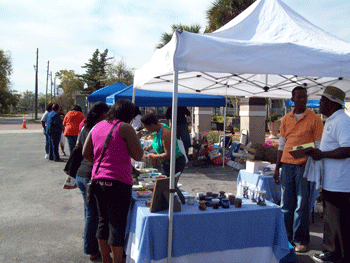 "Consulting to other municipalities who want to start up their own markets is a part-time job", said Moore, his latest effort being Eatonville, whose inaugural Community Market was an exciting event. Markets on public property are an important trend in our cities, for they signal the revival of public space. All too often public space has been defined by soulless plazas, many of which are deserted most of the time. But, with the rise of the public market, the classic agora has been revived in Winter Park, Maitland, Downtown Orlando’s Lake Eola, Eatonville, and elsewhere in Central Florida. Mr. Moore stated that the Winter Park Farmer's Market's summer season is typically the slow time, but last summer was their best one ever, and this winter has been the highest attendance ever, with a waiting list of merchants to get in. He is fine-tuning the mix using common sense, watching people flow and traffic flow. This reflects a locally based entrepreneur who is all instinct and good listening skills; he is not a mall merchandiser using industrial psychology and the appeal of sameness to make sales. North of Orlando lays the town of Eatonville, America’s oldest African-American incorporated community, and it is sandwiched between the affluent Winter Park and Maitland areas. The Eatonville Market, for its part, is attracting produce, food items, and flowers, and is worth a visit on a Saturday morning. Complete with a stage, shoppers are treated to a vibrant music scene as well as a shopping venue, and as this market takes off, it will attract more and more people to this historically significant community. Public open markets are exciting, but perhaps an even more interesting trend is the private-run market. Organizers of private markets can have more authority over the vendors and their merchandise, and can give their markets more style to suit a specific audience. 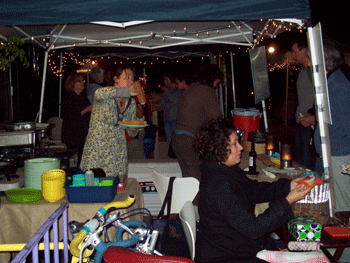 One of the area's more interesting markets occurs at night – the Wednesday evening Audubon Community Market, occurring at Stardust Video and Coffee. Founded by Emily Rankin, the Community Market strives to bring items produced specifically in Audubon Park. This epitomizes the spirit of the new localism. The fact that it occurs at night makes the market scene unique. Ms. Rankin, in an interview, revealed that the Audubon Park Garden District, which she founded, now includes a network of vegetable gardens, and these are showcased at the market. Her cafe, Roots, serves food at this market, and it provides services, locally grown produce, art, music and other handmade items which rotate on a weekly basis.